I want to call this a quick recipe even though it takes 3 hours to get ready. Most of that is letting it sit on the counter though so I think it is an easy addition to a menu. We served it alongside lemon grilled chicken thighs and sauteed corn with bacon this past weekend. Zest and juice 1 lemon and 1 lime. Combine with enough warm tap water to equal 1/2 cup. Place the bulgur wheat in a micowave safe bowl and add the lemon/lime water. Stir and let sit for 20 minutes so that the liquid can rehydrate the bulgur. Taste the bulgur and see if it has rehydrated sufficiently. If not you can either let it continue to sit for another 10-20 minutes or you can cover it with plastic wrap and microwave it on high for 2 minutes. While the bulgur rehydrates you make the dressing. Combine the zest and juice from the second lemon, olive oil, a big pinch of salt, several grinds of pepper and the paprika with a whisk. When the bulgur is ready mix in the parsley and dressing. Stir to combine and refrigerate for 1-2 hours to allow the flavors to meld. 15 minutes before you want to serve the tabouleh prep the tomatoes. We used a mix of grape, cherry and green zebra tomatoes. The grape and cherry ones were halved. The green zebra was diced to an equivalent size. Add the tomatoes, scallions and mint to the bulgur. Stir to combine and serve. Please don’t add the tomatoes before you refrigerate this dish. Tomatoes taste best at room temperature and putting them in the fridge dulls the flavor. Honest. You can refrigerate the leftover tabouleh however it won’t taste nearly as good the second time around. One of the reasons I share the list of what we made for our Saturday night gatherings is so I have a way to recall what we made previously. This dish is based on a recipe I found a year ago which I made, liked and forgot about. I’ve tweaked it a bit to use the spices we had on hand and adjusted the ratios for the amount I was making for Saturday night dinner. My family came over for lunch today to celebrate my sister’s birthday. It was time to come up with a menu for this week and I was lacking in inspiration. So I looked back at what we made last year around this time and basically copied that menu, swapping out the protein for what was on sale at Ye Olde Wholesale Club Store. Tilapia is a go-to protein for us during the week. I keep a bag of warehouse store filets in the freezer. I can pull 3 filets out of the freezer, thaw them quickly in the sink while I prep a side dish and have dinner ready in 30 minutes. 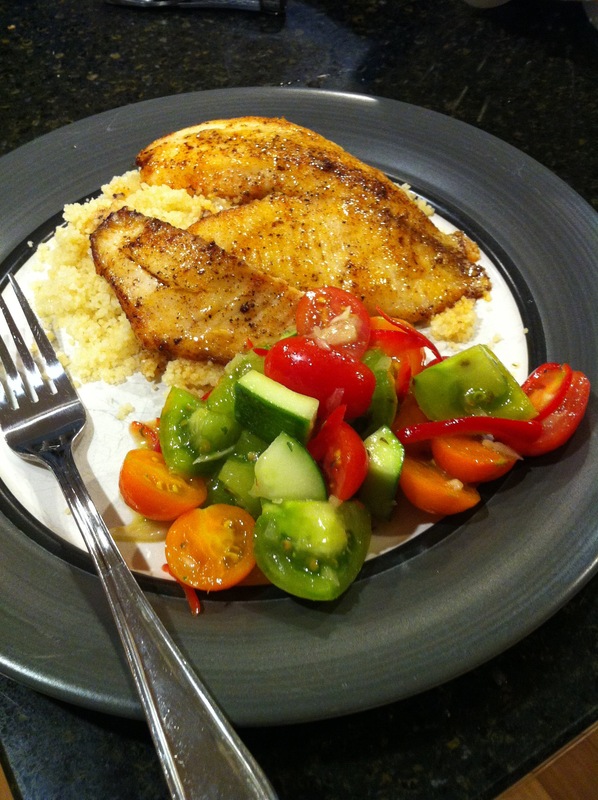 Pan-fried tilapia with onion couscous and tomato-cucumber salad. Tonight we enjoyed the fish with a side of onion couscous and a quick salad of garden fresh tomatoes, thyme, a cucumber from a co-worker and a quick vinaigrette. 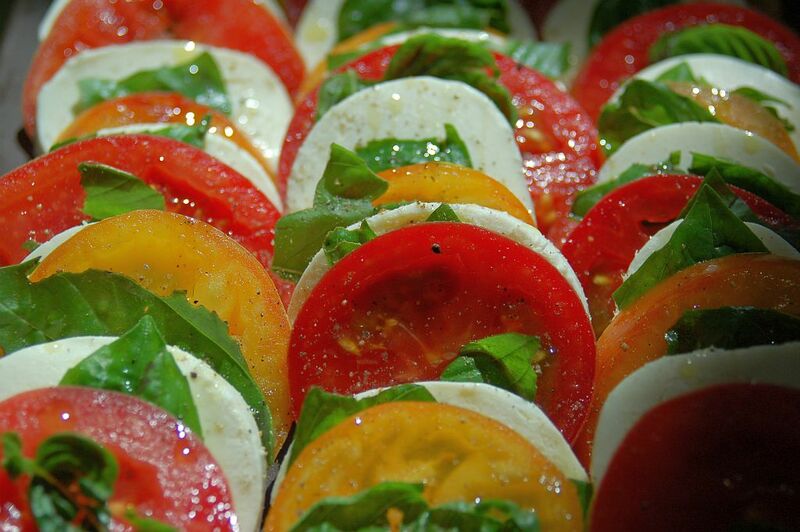 This is a classic combination and it is best with locally grown, fresh from the garden, tomatoes. This isn’t so much of a recipe as an assembly job. Never, ever, refrigerate tomatoes. Refrigeration dulls the flavor and once dulled it will never return to it’s former glory. This warning holds true for this dish as well. Prepare it just before your meal and don’t stick it in the fridge. Banana bread is one of the first things I taught myself to bake. My fondness for bananas often leaves we with a couple of stranglers who are no longer suitable for direct consumption. This became an easy way to use up not so pleasant to look at bananas and have a tasty treat to go with my morning coffee. 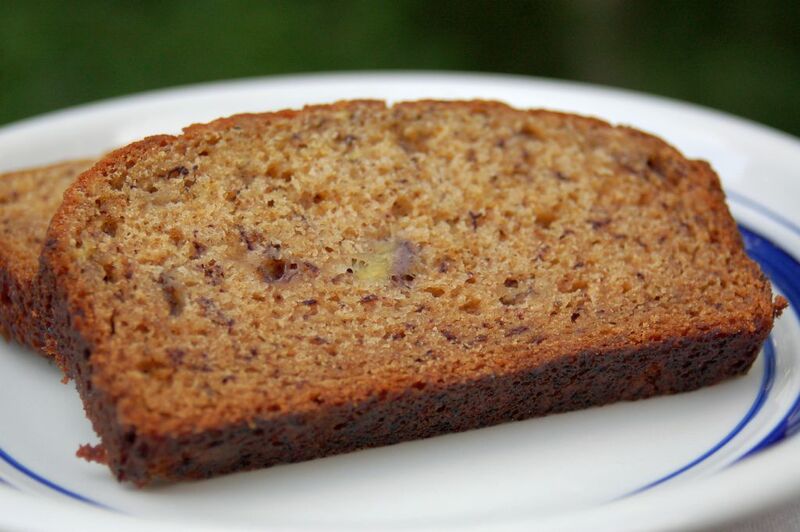 Walnuts are a traditional addition to banana bread. I’m not a fan of nuts in baked goods so I rarely add them. I have been known to add a cup of chocolate chips though or even dried cranberries.